These earrings would make the perfect gift for any upcoming occasion. These earrings include two beautiful Tahitian South Sea pearls with 'Very High' luster, our highest grade available. The mountings include SI quality diamonds totaling .13 Carats. 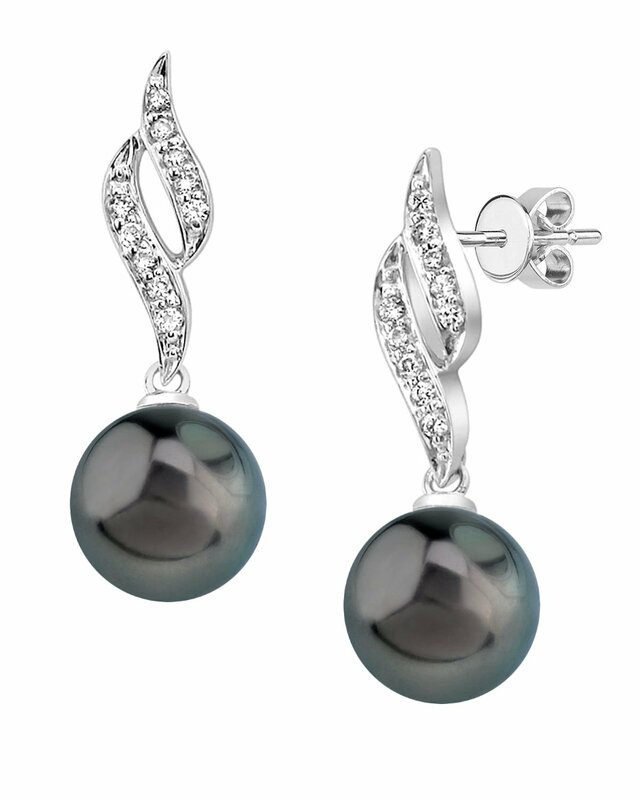 If you want to complete this beautiful pearl jewelry set, be sure to purchase the matching pearl pendant featured at the bottom of the page. If you have any questions, feel free to call us anytime at 1-866-87-Pearl (1-866-877-3275). Love these earrings! Thanks for giving a choice for a "grayer" pearl. I love the black also, but grey is the color I am looking for to go with my mother-of-the-groom dress. Thanks! Beautiful earrings, promptly received and highly recommended. Great value and would definitely use the Pearl Source again. I had to call to ask a couple of questions and the person answering was very helpful. She loved them!! !